Marketer, editor, author, avid reader, and supermom. Tackling social media marketing can be tough. The competition is fierce, and things chance so quickly, just when you’ve learned a new cool trick, it’s already outdated. Or the algorithm has changed. One way to reach larger audience on social media is through hashtags. Hashtags help to organize the massive amounts of content that are posted each second on social sites. 3.2 billion images are shared every day; 95 million just on Instagram. There are 6,000 Tweets every second. 300 hours of video are uploaded to YouTube every minute. What do all these stats mean? There is a lot of content out there. If you want to break through the noise, you need to find better ways of connecting with your target audience. Hashtags give you a way of doing this. People search using hashtags, and by properly labeling your posts, you are more likely to reach the audience searching for something relevant to your business. Hashtags bring like-minded people together. Hashtags help people find others to interact with on social media. For example, the hashtag #veganfood or #vegans allows people who follow the vegan diet to connect with others on social sites. A restaurant that sells vegan food would connect with their audience by using those hashtags. Event hashtags are popular. This allows people attending an event to connect and find others at the event, and see what is happening. It makes them feel like part of a community, and connect with others who attended the event. In the same way, people who couldn’t physically attend an event can vicariously experience it by searching the event hashtags and seeing posts about that event. The same goes for visiting places. People like to connect and share their experiences, and hashtags offer an easy way to do that. Each social site has different ways the users expect to see hashtags, or how they use hashtags. Facebook has a great search features that makes it easy to find posts, pages, and people. Hashtags aren’t emphasized much by the social media giant since incorporating them in 2015. Businesses are left to discover the best hashtag strategy on their own. Don’t use too many hashtags. Studies have found that one hashtag is ideal for posts on Facebook, as you can see from the chart below. Limit your use to one or two crucial hashtags that define the subject of your post. Some businesses use hashtags in humor or satirically. Others use them to organize posts related to a common theme. Posts with hashtags do see a 12.5% increase in engagement, so there is value in using hashtags. Just use them sparingly and with purpose. Instagram users have embraced the concept of hashtags probably more than most mainstream social media channels. It isn’t unusual to see a post with 10+ hashtags. Hashtags are used to organize the millions of pictures into topics so users can browse their interests easily and quickly. 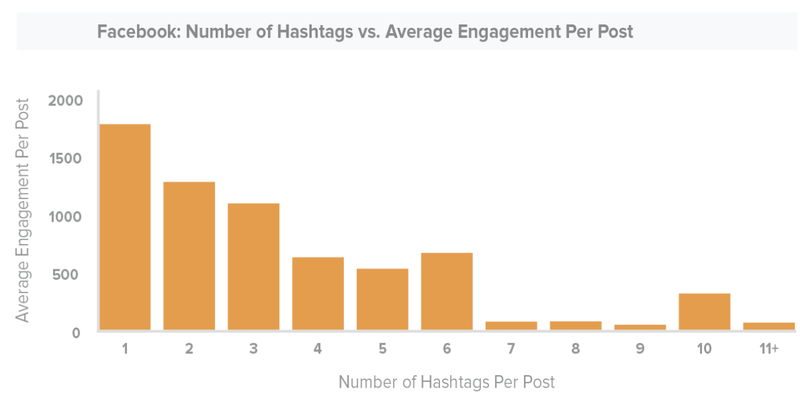 You are more likely to reach a big audience using all relevant hashtags on your content. So go ahead, go #hashtagnuts. Twitter, like Instagram, uses hashtags to organize content. With millions of daily tweets, and many users have thousands of tweets in their streams, often hashtags is one of the best ways to find like-minded people or specific content. I use Tweetdeck to set up hashtags I want to watch, and interact with users based on shared interests. This is a great way to follow hashtags that potential customers might be using, and engage with them directly. On a site like Twitter where people are more there to broadcast than to read, the best way to break through the noise is to engage with them by liking, sharing, or commenting on their tweets. Twitter also puts considerable effort in organizing Trending Tags. Users can select the region they want to see trending tags in, and the current trends are displayed prominently on the left sidebar. LinkedIn is professional. Using dozens of hashtags like on Instagram or Twitter could be a mistake. However, LinkedIn has really been creating new ways for businesses and individuals to use hashtags to connect with others or find relevant content. One way they encourage hashtag use is by suggesting hashtags based on the content of your post. Users can select from people or hashtags to follow on their home feed. Selecting several relevant hashtags will help your content show up for users that follow those content tags. LinkedIn has also been adding new ways to curate content by allowing businesses to get “content suggestions”. As your page, you can choose hashtags to follow that will provide content suggestions you can then share with your clever insights on your business page. 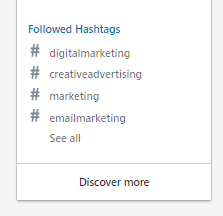 Notice how LinkedIn only allows you to choose 3 hashtags to associate with your page. This is to keep brands from following and sharing content that might not be relevant to their business. Each site has a unique way they use hashtags, and users have adopted their own trends on these sites. By posting content specific for each site, rather than just posting the same thing across all sites, you can really optimize your strategy to increase engagement. There are several ways to work hashtags into your social media strategy. This is going to require you to think on your feet, as trending hashtags change quickly. But if you see a trending hashtag and have relevant content to post, do it! This is a great way to gain more views. Just don’t post content unrelated to the trend in an effort to get more eyes on it. While more people might see it, it is also more likely to look like spam and give viewers a negative impression of your business. I always roll my eyes and skim past posts that are obviously not related to the hashtags I'm looking up. Don't be that guy/gal. Or that brand. Check out this hilarious video by Popular Science on Twitter that uses the trending hashtag #NationalHighFiveDay to generate engagement. Social sites often post trending hashtags somewhere easy to view, like Twitter and Facebook on their home feed screens. Hashtags that are relevant to a business can help you connect with your target audience. Just like in the Vegan example above, each industry or lifestyle has popular hashtags. It is worth your time to do a little research and find the hashtags popular for your business type. Andrew Frey and Joe are attending FanX in Salt Lake City this weekend to represent our newest partner company, CryptoComics. We are setting up our social media strategy for the event, and part of that includes selecting the proper hashtags for that particular industry. To connect with people at the event, we plan to use the official event hashtags #fanxspring19 and #fanxspring, as you may have noticed in the Event example from Facebook above. Most events include their official hashtag on their website. In addition, we’ll want to include the niche hashtags for the comic book and comic convention industry. 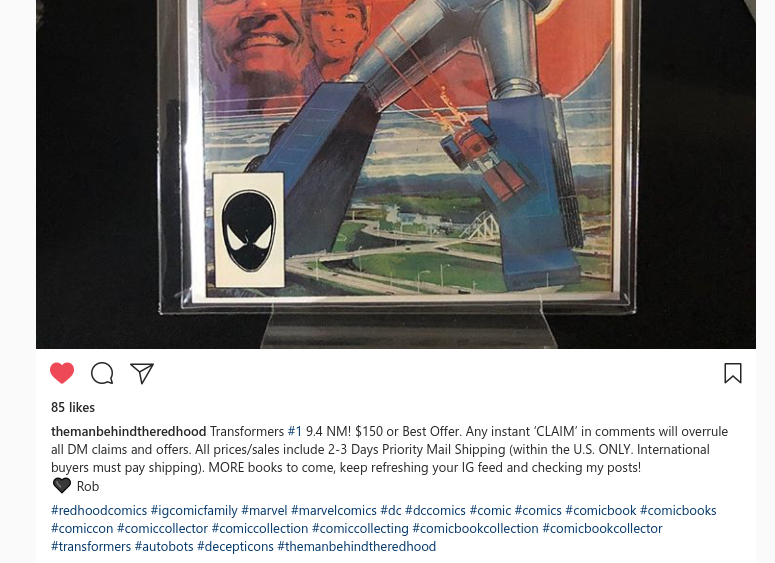 #comicon #cosplay #comics #comicart are just a few of the hashtags our target audience identify with and will help us better connect with them during and after the event. In addition to trending hashtags and tags relevant to your target audience or industry niche, each day of the week also has popular hashtags associated with it. Using the daily themes can help increase the exposure of your posts as well to a broad audience. 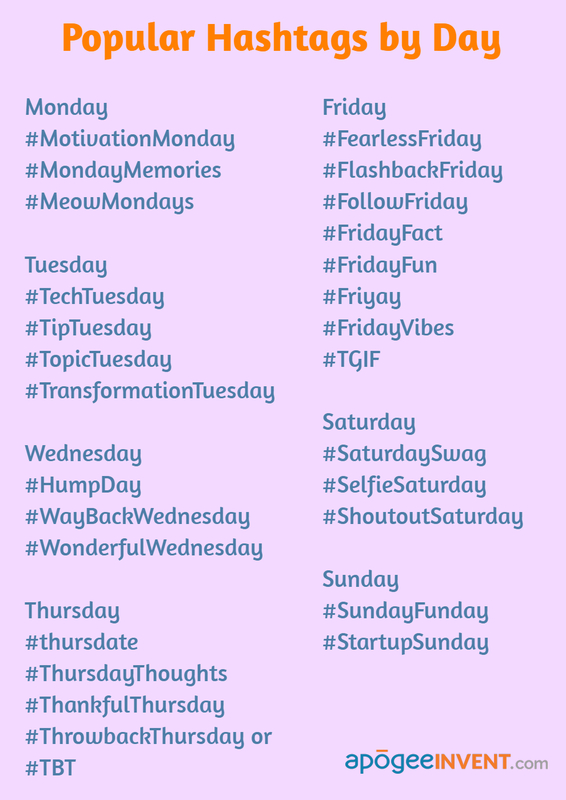 Here is a list of daily hashtags. Keep in mind that these can vary slightly from platform to platform or over time. #MotivationMonday: Post something inspiring or that motivates you. Ask followers to share their most motivating quotes. #MondayMemories: Share memories of your business, or personal stories that relate to your industry. #MeowMondays: You know what they say about the Internet and cats. Don’t be afraid to share those hilarious cat memes, particularly if they relate to your industry. #TechTuesday: Are you using some new tech that you love, or have some news related to tech in your industry? Share it! #TipTuesday: Share a tip that your audience will appreciate. #TopicTuesday: Pick a topic to talk about for the day that is important to your business. #TransformationTuesday: This doesn’t have to be just for fitness people. How is your business transforming the industry, or what changes have you made recently that you can share? #HumpDay: Every loves a great hump day post to get them over the hump. #WayBackWednesday: This came from the popularity of Throwback Thursday, but it is another opportunity to reminisce about the good old days, and maybe have a few laughs about how things used to be. Or, share inspiring stories of how your business started. #WonderfulWednesday: What is great about today? Share something uplifting. #WednesdayWisdom: Heard some valuable wisdom lately? Share it with your followers. #thursdate: Plan a weekly event on that day, or talk about upcoming events. #ThursdayThoughts: Your chance to be creative and encourage followers to share their thoughts about your business or industry news, or just share your own thoughts for followers to relate to. #ThankfulThursday: Gratitude is infectious, and can be good for your health, and your business. Share things you’re grateful for. #ThrowbackThursday or #TBT: Like WBW, this is a great time to help followers learn more about your business and how it has grown over the years. #FearlessFriday: Talk about obstacles you’ve overcome in your business, or encourage followers to be fearless. #FlashbackFriday: Yup, another opportunity to look back on the past. #FollowFriday: Give a shout out to some great customers or other users that you think are worth a follow. Who knows, maybe they’ll return the favor. #FridayFact: Tell them something they didn’t know. What do you find amazing? #FridayFun, Friyay, FridayVibes, #TGIF: Celebrate the end of the work week with posts about fun, humor, or weekend plans. #SaturdaySwag: Show off your swag. This could be having fun in the office or cool merchandise; have fun with it! #ShoutoutSaturday: Mention great customers, partner businesses, or motivational influencers in your industry. #SundayFunday: It is ok for businesses to have fun. I think. #StartupSunday: Give some love to a startup, or talk about your own business adventures as a startup. Did I miss any of your favorite hashtags? Share them with me in the comments! Here is a quick reference image you can save. I have one sitting on my desk that I get out when I do my daily social media posting. Keep in mind that using hashtags isn’t going to guarantee more follows or engagement. You also need to have engaging posts that people can relate to. But if you’re posting great content and you use these hashtags best practices, I promise you will reach more people.